The healthcare industry is under pressure to deliver new capabilities in response to industry pressures like the Affordable Care Act. Most organizations have a multitude of initiatives under way, and there are time pressures and resource constraints that are non-negotiable. Most organizations believe they conduct careful planning and that existing processes will adequately mitigate risk. At Nolan, we believe companies should go one step further and embrace the 80% likelihood that serious issues will arise. Our Expected Outcome Health Check provides a quick, accurate evaluation of the risks and obstructions for large, inflight initiatives and delivers an assessment of the anticipated outcomes based on the current trajectory. It also provides a roadmap for corrective actions. Most organizations have a framework for managing major change efforts. Typically, the framework includes risk assessment, program governance, scope management, change management, milestones, testing, and reporting. Our approach provides an inflight view of the overall effort from a different perspective. We begin with an Expected Outcome Model that details the initiative’s original goals and objectives, drivers, and timelines. We then outline where your effort is at risk of running short and pinpoint the potential obstacles to success. From there, we create a Revised Outcome Model based on predicted impacts if no changes are made, and we identify opportunities to close the gap and move the project back toward the original desired results. The unique benefit of the Expected Outcome Health Check is that it allows your executive team to view and manage risk in the broader context of how other companies have succeeded with major initiatives. Rather than simply deferring to the established process and expecting success, your team accepts the hard truth that 80% of large initiatives encounter substantial obstacles that materially affect the desired outcome. As a result, they can take proactive steps to make the hard changes needed to get the expected results. 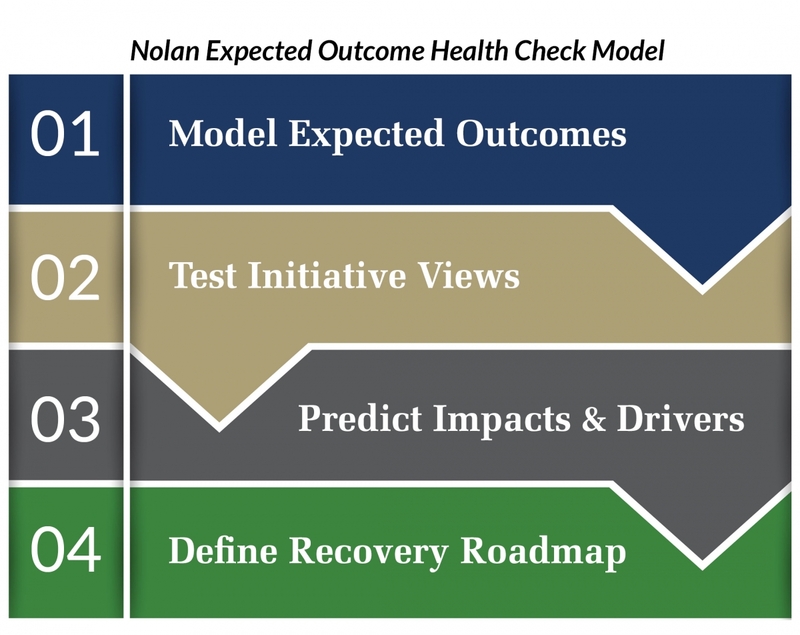 In addition to making a profound and immediate impact on the effort in question, the Expected Outcome Health Check builds a culture of accountability, a realistic acceptance of risk probabilities, and a framework for improvement going forward.